Try some of our simple and delicious breakfast ideas, and learn how prioritizing breakfast during the holidays can help you stay on track with your goals. There are festivities just about every month of the year, including Valentine’s Day, Easter, Memorial Day, summer barbeques, birthday parties, Halloween, Thanksgiving, Hanukah, Christmas, and New Year’s. The enticing holiday treats and comforting meals can get in the way of your nutrition goals, so let’s look at something you can focus on at mealtimes to keep you on track! Now for the good news. Did you know that by focusing on adding food into your holiday routine, you can be more likely to make good food choices? Yes, we said add! With thoughts on family feasts, it can be easy to forget about breakfast– the most important meal of the day, holiday or not! Skipping breakfast can leave you more likely to overeat later, as well as have a negative effect on your mood.1 Research has shown that eating breakfast can also help minimize impulsive snacking later in the day, which is an important part of weight management. So, start every day off right with a balanced breakfast, high in phytochemicals, protein, and fiber. Getting in that healthy breakfast will leave you feeling full and satisfied rather than ravenous when the festivities and food begin. You’ll still be able to enjoy your favorite dishes, but likely will have a more sizeable portion that keeps you satisfied. PB and Banana Toast: Whole wheat toast with 1-2 Tbsp of peanut butter and banana slices. Optional: Sprinkle with cinnamon, ground flaxseed (packed with omega-3s!) or cocoa powder. Power Oat Bowl: Oatmeal with 2 Tbsp of raisins or fresh fruit, a handful of nuts or seeds, and low-fat milk or milk alternative. Add a scoop of low-fat or nonfat Greek yogurt for a protein boost. Souped-up Cereal: Whole-grain cereal with berries or dried fruit and low-fat milk or milk alternative. Learn how to choose a healthy breakfast cereal. 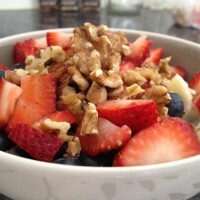 Fruit and Yogurt Bowl: Nonfat or low-fat yogurt with fresh fruit and whole-grain cereal, nuts or raisins. Balanced Breakfast Smoothie: A breakfast smoothie made with nonfat or low-fat yogurt, fresh or frozen fruit, and ice. Optional: Add something green, such as spinach or kale. For fruitier smoothies, lemon adds a nice refreshing touch. Try these other smoothie ideas. Easy Eggs: Scrambled eggs with whole wheat toast, topped with reduced-fat cheese or sliced avocado and paired with a side of sliced apple. Veggie Omelet: An omelet loaded with veggies such as onions, bell peppers, spinach, or mushrooms and topped with reduced-fat cheese or avocado. Serve with a side of fresh fruit. Fruit Wrap: A quick fruit wrap made with peanut butter and banana rolled up in a warm whole-grain tortilla or two corn tortillas. The holidays tend to bring an extra layer of stress and a shortage of time, but don’t forget how important it is to prioritize your health. If you aren’t used to eating breakfast daily, set a goal each week for a certain number of days you’ll start with breakfast, and work your way up to the full 7. With a little planning, you can feel better, avoid unhealthy food choices during the holidays, and stay on track with your health goals throughout the year!